This is an adaptation by Hayao Miyazaki of the children’s book of the same name by Diana Wynne Jones, featuring a strong heroine who gets in a lot of trouble. This character, Sophie, is an 18-year-old who works in a hat shop in a European-looking town – if Europe in the 19th century was magical and historically fun with a great deal of technology. It’s clearly an alternative universe. Eventually Sophie is cursed by a witch, making her age immediately, and consequentely forcing her to leave town. She then comes across the Moving Castle, a mystical thing with doors to many worlds and Howl, a dashing young man with powers to fight demons. For Miyazaki fans this is a real delight – a film where Miyazaki puts his imaginative genius to work, and where he continues to display his talents as an emotionally intense storyteller. Each character has a fully developed story and always undergoes big changes – even if it’s just puberty – and interesting journeys. I associate this film with nightmarish stories: what would happen if the old tales we tell children were mixed with themes such as horror and abandonment even while looking bright and dreamy? Everything is so detailed, visually stunning and looks so natural, it’s hard to understand how truly complex the making of such a film is. 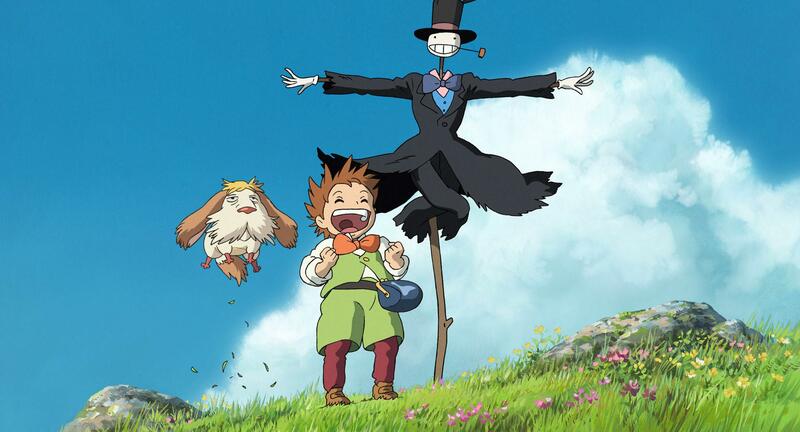 With Miyazaki there are always valuable lessons to be learned and this story is definitely a must-see. 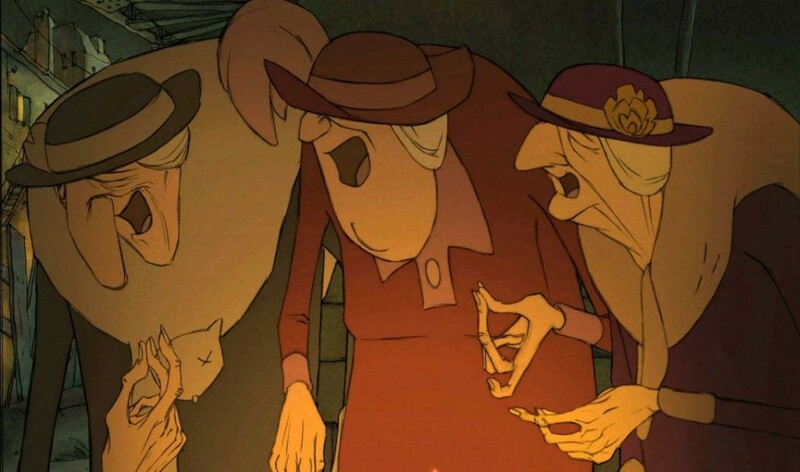 Unmistakably a Sylvain Chomet offering, in a most charming film. The story is moving but in a sublte way. If someone were to catch this film in the middle, they probably wouldn’t be able to tell work out the storyline. It focuses on the love of a grandmother towards her grandchild, Champion, and the lengths she’ll go to keep him safe and happy. After a melancholy childhood, Champion becomes a professional cyclist. His grandmother, who acts as his coach, is following him on the famous Tour de France when the French mafia kidnaps him and take him to Belleville with two other very tired athletes, for gambling purposes. The climax occurs when both the grandmother and their infinitely loyal dog chase after him, crossing oceans and even living on the streets just to find him. The melancholic tone endures throughout but the fact that there is barely any dialogue in this film gives it added charm. Then we meet The Triplets, three extremely poor old ladies that make music out of anything and come to represent real friendship by helping the grandmother in her quest. The animation blends seamlessly with the melancholic feel of the film, assisted by a wonderful score (including a very catchy tune and a purposely terribly-played Portuguese song). You can’t help but smile at the characters’ strange figures and their actions. It’s all about dreams, passions and all kinds of family bonds. Rama, a blue-skinned incarnation of God Vishnu, is the ideal man, who restores order and righteousness to the world, and for that we must honor him at all times. Nina Paley doesn’t focus on him though, but on his wife, Sita, and so it becomes a tale of romance and feminism, dramatizing the problems that Western cultures have with the original story – specifically, how Rama treats Sita. It’s a refreshing view on Rama as a cruel man and Sita as the incredibly dedicated woman who is violently abducted. It’s easy to see why it would cause such controversy among Hindu tradionalists. Paley has created something wonderful here, a modest rendition whose visual portrayal is playful, reminding us of collages, paintings, and lively comic books, all the while using very simple lines and generating smiles and laughs just through the alternative use of animation. ensues, leading them to hide in Ernest’s faraway house. They learn about each other and realize no one else likes or cares about them, and therefore grow closer togehter. The animation is particularly interesting in the dream sequences of both characters with the shadows in the hand-drawn animations standing out vividly. Pauline Brunner does a fantastic job giving Célestine a childish cute voice and Lambert Wilson does the same for Ernest by effortlessly going from polite and happy to scary and loud. The real awe here goes for the way discrimination, bigotry, labels and prejudice are portrayed through the use of a mouse and a bear who just want to be friends and live together forever, and have to make everyone understand it. If there’s one word to describe it, it’s ‘sweet’. This is possibly the most adult film on this list. It is violent and strong depiction of Ari Folman’s (director) memoirs as an infantry soldier in the Israel Defence Forces in 1982. 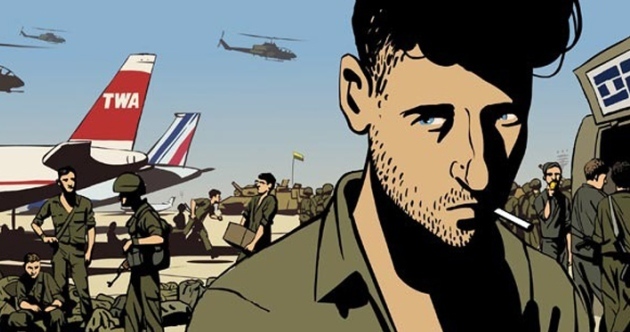 In 2006, when a friend from the army meets him to talk about his nightmares and how they’re connected to his experiences in the war, Folman realizes he doesn’t remember that period at all. He begins a search for his memories, rushing off to find help from people who were in Beirut at that time: friends, soldiers, a psychologist, and an Israeli reporter, among others. A devastating film that reconstructs how a massacre by the Christian militia took place because people with power to stop it took no action against it – a story of passive genocide. Folman is an Israeli documentarian who now uses animation to reconstruct memories, hallucinations, nightmares, the past. He made his memories come alive with surreal animation work, allowing him to capture his thoughts, making it possible for him to depict his and the other characters’ stories and nightmares. 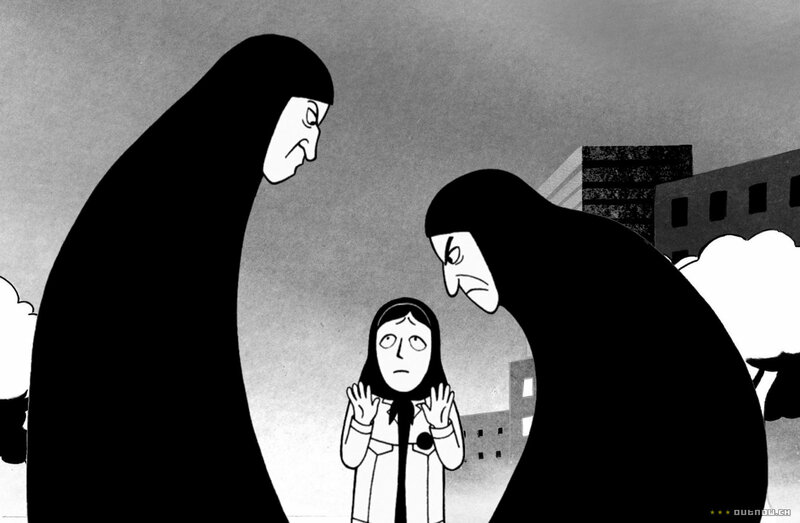 Charmingly simple, Persepolis is based on the autobiographical graphic novel of the same name by Franco-Iranian Marjane Satrapi, who directed the film alongside Vincent Paronnaud. It is coming-of-age story of a little girl, Satrapi, growing up in pre-revolutionary Iran in the 1970s. The animation consists mostly of monochromatic tones, bold black lines and some grey nuances. Funny and moving but very authentic and with an interesting depth of field effect through a series of 2D planes, with the occasional appearance of color. It is the ideal adaptation of the original comic, giving life to still images without ever destroying its foundation. After happily remembering the first ten years or so of her life as an imaginative child surrounded by a light hearted, loving family, we then see how women had to hide their faces from men, and had to put aside various kinds of Western influences. Marjane does indeed grow up, being sent abroad for a European education, and later feeling homesick for old Iran, which no longer exists as she first remembered. A great deal is packed into this 98-minute film, including the character’s spirit and the importance of feminist figures in countries who deny freedom as a birthright. Adam Elliot wrote and directed this film based on a true story, a claymation tale of Asperger’s syndrome and a long-distance friendship. The Australian film first introduces friendless Mary, who lives in a small Australian town with troubled parents and a pet rooster. Her grandfather tells her babies come from the bottom of beer glasses. Her scepticism prompts her to look for a random address in the phone directory and she proceeds to send a letter to American Max Harowitz asking how babies are made. Max is a lonely, middle-aged New York Jew with Asperger’s syndrome, also without friends. He responds to the letter and a friendship is kindled through a correspondence that lasts for over a decade. 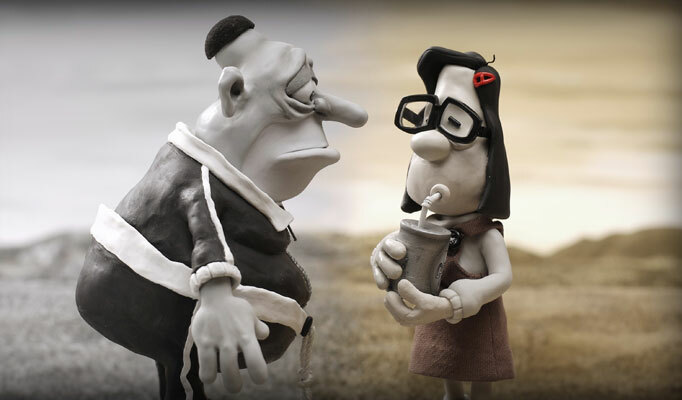 The use of claymation turns this deep subject into a quirky one. It allows us to laugh at moments where typically we would be very emotional – and there are many of those. The characters are brilliantly written: bizarre and, to an extent, clueless. It’s a bittersweet tragedy, unafraid to give the characters dark paths, bringing out the best and worst in each other over the years. Max’s Asperger’s syndrome is represented with such positivity, that it convinces us to accept ourselves the way we are. It deals with other aspects that makes it an emotional experience, such as depression, heartbreak, alcoholism, suicide and death. The monochromatic claymation is representative of these subjects and the voice cast is impressive, with Toni Collette as Mary and Phillip Seymour Hoffman as Max. Japanese national treasure Hayao Miyazaki tells the story of a ten year-old girl named Chihiro who, while moving to a new neighborhood, enters the spirit world. As other Miyazaki films have shown, the girl is the heroine, and her main objective is to save her family. She begins as a seemingly bratty kid, angry at her family and unhappy about leaving her friends behind, and ends as a grown-up child who learns to rely only on herself and who has realized what’s really important in life. Making a world seem magical and fantastic as a representation of a child’s mind and vision is characteristic of this director’s films, but this was without a doubt his masterpiece of the 2000s – and possibly his last. There’s so much to this story that it is practically impossible to sum up; and there are many theories about certain details in the film that underline how extremely complex and fascinating it is. The hand-drawn and then digitized animation has a ravishing quality that makes it timeless, with multiple visual inventions which look effortless. The focus is on the theme here, in how a child reacts to dislocation, to sudden loneliness and loss. 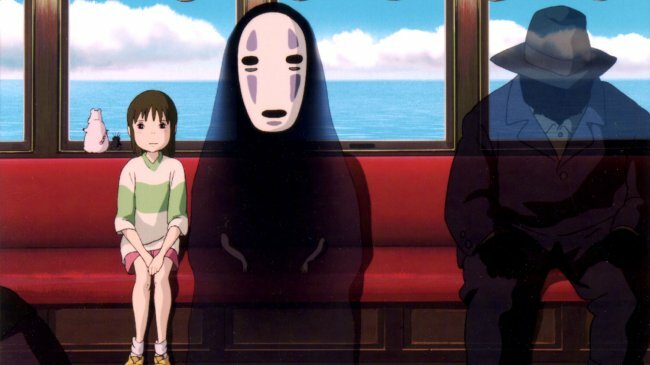 The cultural weight of Spirited Away as the most successful film in Japanese history serves to represent it not only as one of the best films – not just animated – of the 2000s, but as one of the best animated films of all time.